Pintxos bars -- the Basque equivalent of tapas -- are the cornerstone of San Sebastian's thriving foodie culture. 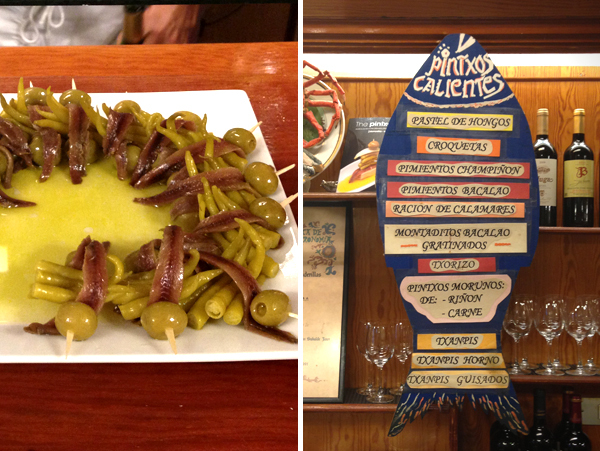 San Sebastian has evolved into quite a food Mecca over the last 30 years. Together with the surrounding area, Spanish Basque country has the highest number of Michelin star restaurants in the world. 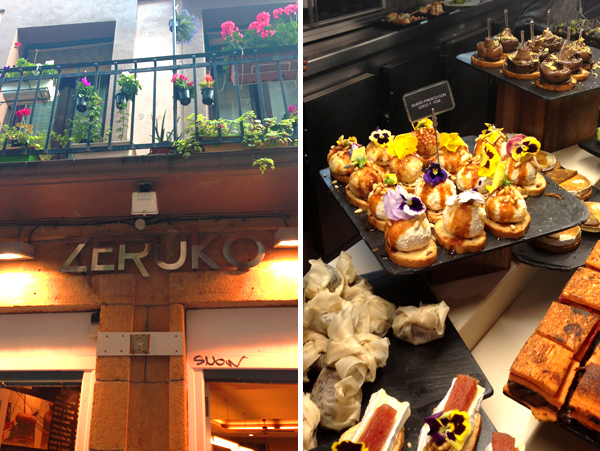 But molecular gastronomy aside, it's really the down home pintxos bars -- the Basque equivalent of tapas -- that form the cornerstone of San Sebastian's foodie culture. The old quarter of the city is packed with pintxos restaurants -- so many that knowing where to go and what to order can be very overwhelming. I was lucky to have some expert assistance when I began my trip. San Sebastian Food, a luxury gastronomy company in the area, showed me the ropes, took the reins on ordering, and indulged me in all my food nerdiness. It was great to have someone there give me all the cultural background on what I was eating, how the ingredients were produced, and why the dishes came to be -- like, for instance, that the Gilda, a skewer with anchovies, olives and hot peppers, was named after Rita Hayworth because she is similarly tall and spicy. Pintxos eating is rooted in many traditions. First, you're meant to throw your napkins on the ground. This also means that the dirtier the pintxos bar, the better it is. 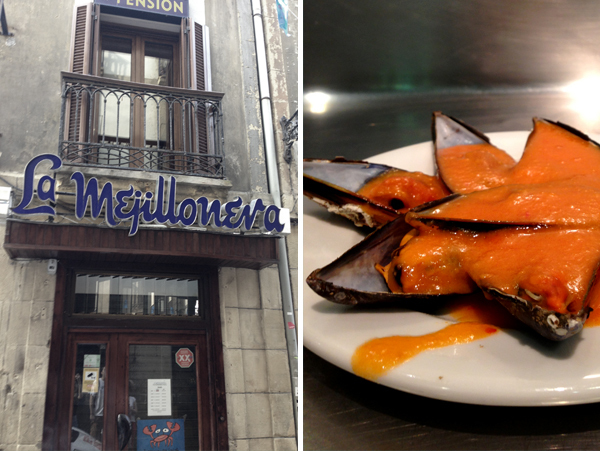 In the case of La Mejillonera, where the specialty is mussels of all kinds, the empty shells are even discarded on the floor (think peanut shells in a New England ale house). The second most important thing about Basque culture is that everyone respects the honor system. You order drinks and bites as you go. When you're ready to leave, you tell the bartender what you had and pay. It was very jarring for this New Yorker not to pull out a credit card after each glass of Rioja. But it's a superior experience for the diner, so long as no one takes advantage. I could go on and on about San Sebastian, but I want to let you discover it for yourself. Below is a list of all my favorite pintxos spots and what to eat there. Most places I discovered through San Sebastian Food, and a few I went to throughout the week per their recommendations. Each spot has a different specialty, which was usually written on a chalkboard behind the bar. The cold dishes are laid out on the counter, but you really need to know what each place is known for if you want to order right and not feel like a big dumb American weenie right off the plane. 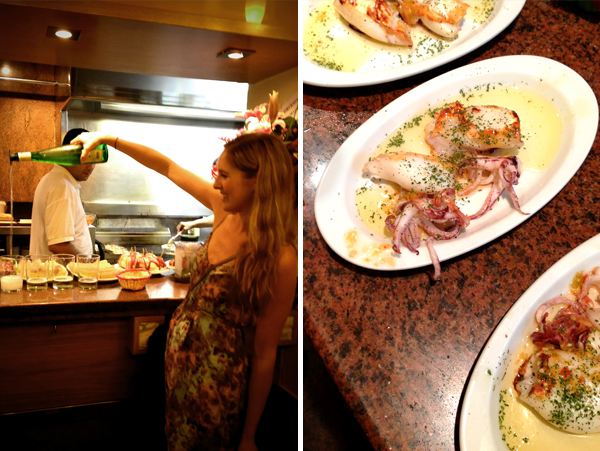 This is the place to go for seafood a la plancha. 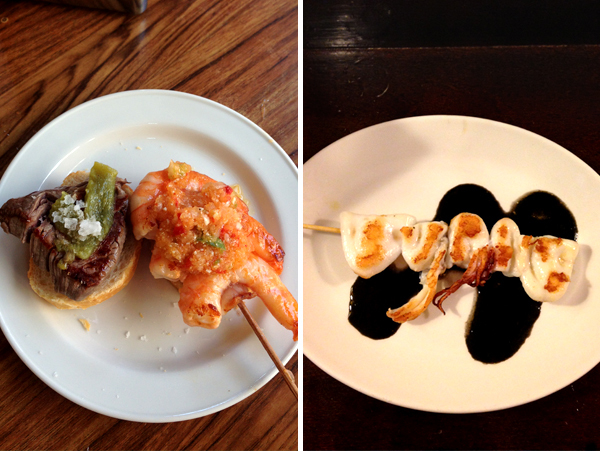 We had wonderful prawn skewers (brocheta de gambas), grilled squid (chipiron a la plancha), and pimientos di padron. They all pair great with Txakoli, the young white wine of the region that was described to me as a "breakfast wine." Get the recipe for Squid and Shrimp Skewers here. If the fish-shaped menu on the wall is any indication, this place is all anchovies, all the time. Try the Gilda, the first pintxos invented in San Sebastian and named for Rita Hayworth because again, she is tall and spicy. This is also where I had the anchovy toast with blueberry jam. Have some sidra with the meal. This is one of the modernist pintxos bars that incorporates some of the molecular gastronomy that the region is known for. The bar is full of interesting and beautiful creations. Go to town! We ate a ton here, and it's one of the places that I returned to. Idiazabal and Hongos (sheep milk cheese and wild mushroom) Risotto was amazing. But glutards be warned: "risotto" in San Sebastian is made with orzo, not rice. The Veal Cheeks (pictured) here are melt in your mouth amazing, as is the pulpo (octopus). Though less traditional in the north, they also served up a great Salmorejo -- a creamy-style gazpacho that was my go-to when traveling in Andalucia. Don't miss the solomio (pictured). And do a little surf and turf by pairing it with the shrimp and chorizo brocheta. We drank an amazing red wine here: Ribera del Duero (Krel). This is the place for seasonal specialties like the mushroom plate. It's expensive, but worth it. You'll never taste anything so pure and umami-laden. Wash it all down with a glass of Navarra rose. I would have never guessed I'd be eating cheesecake in San Sebastian. But you'd be a fool to not grab a slice at La Vina. It's very light and airy -- a cross between a custard and a cheesecake. The tortilla ain't half bad either if you want to return for lunch. Get the recipe for Spanish-Style Cheesecake here. This place is packed with locals. Don't be shy and elbow your way to the counter. I had every type of mussels and they were all delicious. 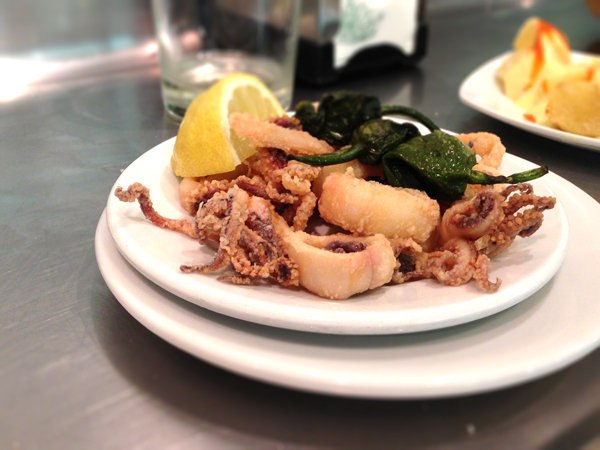 Try the mejillones picantes, Patatas Bravas, and Calamares. This place was on the New York Times list and also makes a mean veal cheek. The bacalao and bonito were also delicious. Like Borda Berri you can't really go wrong with whatever is on the chalkboard. So get adventurous. 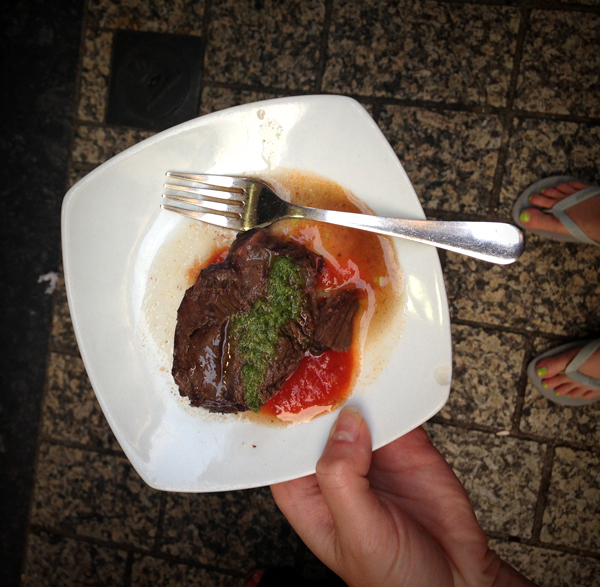 For more on where to eat, drink, and sleep in San Sebastian, check out my full guide here.